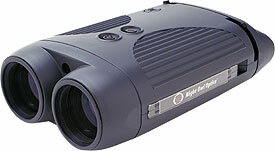 The all-new Light™ is a quality night vision monocular with an optional infrared illuminator in a compact body design. The NOLT2 features an accentuated palm grip with ergonomically placed soft-touch operational buttons for easy one-hand operation. 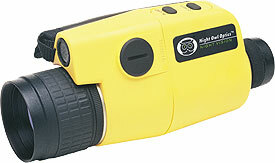 The new Light™ monocular is an ideal device for casual nocturnal viewing. At 16 ounces, the NOCC3 compact night vision monocular boasts a powerful integrated infrared illuminator in one of the lightest body styles available. With easy to operate power and IR controls, both with indicator lights, the NOCC3 is equipped with a 42mm objective lens operating at a 1:1.2 aperture with 3.1x image magnification for quality nocturnal viewing. The Odyssey™ is a 100% waterproof floating device, yet it is compact and lightweight at 14oz. The NONO3Y features power and IR light indications for easy operation and comes with a refined, fully integrated infrared illuminator. Furthermore, the Odyssey™ boasts our exclusive ocular with five individual glass elements, 3.1x image magnification and 42mm objective lens for clear nocturnal viewing results. The NONO3Y comes in a highly visible sports yellow finish. The brand new Discovery™ is a versatile night vision monocular incorporating our powerful integrated infrared illuminator and a tripod adapter within a lightweight and small body frame. It features soft-touch control buttons, power and IR indicators and a compact ergonomic design that comfortably fits in one hand. Equipped with our standard five-element glass ocular and an objective assembly that includes a condenser lens for brighter images. 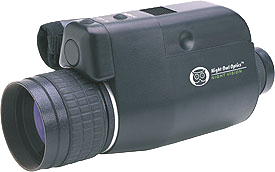 Compact night vision binocular with integrated infrared illuminator. Featuring a special Uni-body construction, the Night Hawk™ houses two high-quality intensifier tubes that are pre-adjusted for optimal viewing results. 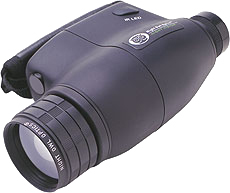 Quick diopter adjustment and instant distance focus ensure quick action and is perfect for game movement and wildlife observation. Protective lens covers are secured to the body. 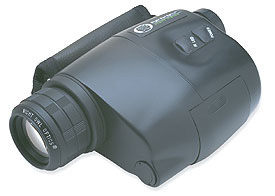 Premium night vision goggles with integrated infrared illuminator. The face-mounted Night Owl Goggles™ feature convenient hands-free viewing with 1:1 real-time image projection and 1,885 feet field of view. The NOTG1 provides an extremely close-up focusing range from 9" - infinity. Additionally, the Goggles™ feature a high-performance integrated infrared illuminator for comfortable viewing in complete darkness.